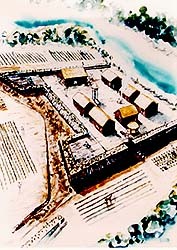 Drawing of how Fort Mose may have appeared in the 18th century. 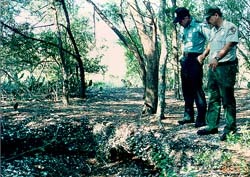 National Park Service employees examining the site. Fort Mose, now a Historic State Park, is a precursor site of the Underground Railroad, demonstrating that resistance to slavery was both early and fierce, and that it arose decades before abolitionism became organized and influential. The fort, established as part of the northern defense line for Spanish St. Augustine during the mid-18th century, was the earliest known legally sanctioned free black community in the present United States. Its site contains archeological evidence of Native American occupations and the later British, second Spanish, and American presence. Fort Mose's inhabitants were mainly runaway black slaves from the British colonies of South Carolina and Georgia, who escaped to freedom to Spanish, Florida in small groups at least as early as 1687. The Spanish Governors of Florida established Fort Mose in 1738, abandoned it in 1740, but reestablished the fort at a nearby site in 1752. In defending their freedom and Spanish Florida in the middle decades of the 18th century, the black inhabitants of Fort Mose played a significant role in the geopolitical conflicts between Britain and Spain in the Southeast. The Fort Mose Historic State Park is open to the public. 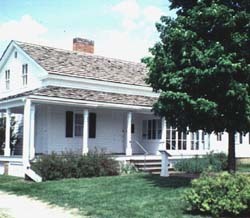 Visitors can still view the land where the settlement once stood, although there are no remains of the earth and woodon structures. Visitors can visit the newly constructed visitor center and museum or explore the ground and view the many exhibits avaliable. You can visit Fort Mose Historic State Park's website here.